Classic kitchen gadget, the SodaStream, which has fizzed up drinks in homes since the 70s, is back in a sleek new version. The SodaStream of 2009 comes in different colours (chrome, red and white) with a new emphasis on being eco-friendly and health-conscious. Very late noughties. The strapline is still an original 70s gem though – “Get busy with the fizzy!”. The new model uses the same mechanism as the classic gadget with a few tweaks around the edges. For example: the flavours all come with new low-sugar varieties, including Cola, Lemonade, Limited Edition Orange & Mango and vitamin-rich ‘Energy’. Green credentials come from the fact that the SodaStream doesn’t use batteries or electricity, but is powered by Alco2Jet Cylinders which are refillable. They tell us SodaStream is a highly energy-efficient small appliance. And as they point out, if you make your own fizzy drinks instead of buying them, that saves on packaging. Apparently every one litre bottle of SodaStream you make saves three aluminium cans. The soda-maker is £59.98 with gas canisters and bottles of flavours starting from £2.99. An SodaStream Pop-up Shop will open in Central London in mid-December selling limited-edition products. 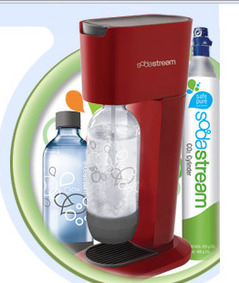 You can also buy SodaStream via sodastream.co.uk and selected stores (listed on the website).